Prior to returning to Virginia just 5 years ago, I regularly escaped the perimeter of Atlanta on the weekends in search of solitude and adventure. Most weekends were devoted to developing my whitewater skills within 2-3 hours from the metro but occasionally my travels took me beyond a day trip. I remember my first trip to the Russell Fork vividly. I broke away from work early on a Friday to get a leg up on the traffic and ventured north traveling mostly highway miles into Virginia. Near Lebanon, VA I left the four lane traffic behind and headed deep into the heart of Appalachia. I was meeting some open boater (whitewater canoeing) friends of mine and the 7 hour trip from Georgia was weighing heavy on my eyelids. By the time I pulled over, it was so dark I wasn't sure where I was - I resourced the first turnout on VA 83 and crawled into the back of my Tacoma. As the night hours screamed by I quickly woke to coal trucks barreling down the road well before the fog lifted from the tight and steep terrain that engulfed my surroundings. Within minutes I was back at it and only 30 minutes from the river. I wasn't familiar with the area at all. I grew up only hours away from the Russell Fork but never ventured this far south and west while in living Virginia. After we ended our float on Saturday we made our way to Breaks Interstate Park to set up camp. Yet again it was dark, so I hadn't had a chance to really see the views my friends were chatting about. Just before the sun rose on Sunday morning I shuffled down to the lodge for some breakfast and coffee. 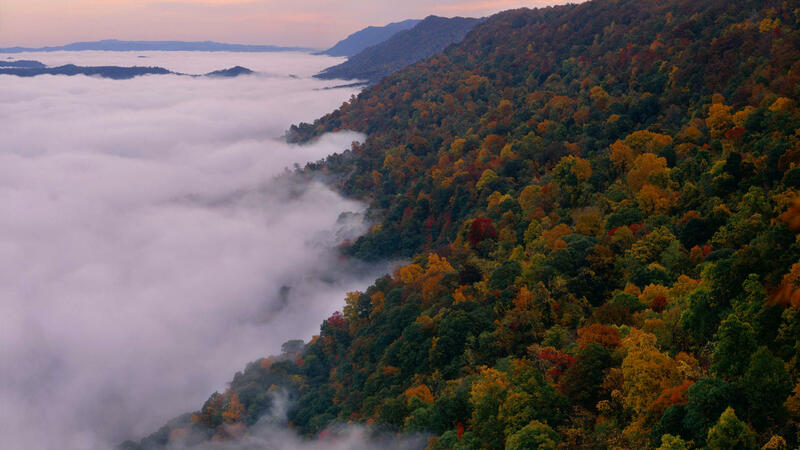 As the fog lifted, I witnessed something truly amazing; a epic view of what some refer to as the "Grand Canyon of the South" - Breaks Canyon and the Russell Fork Gorge. Team MSO is about one month away from embarking on another weekend adventure and I'm taking the Team south to witness the inner beauty of Appalachia. We'll be filming Episode 7 and wrapping up Season 1 with an overland adventure that starts in Pax, WV. As the route continues to develop, we're working in some stops to offer you some realistic views of Coal Country and breathtaking images of Appalachia. Cover photo courtesy Flourish Magazine.